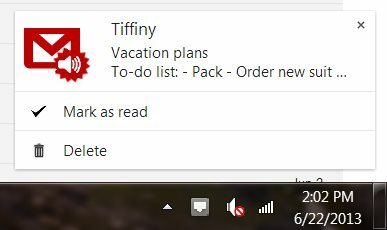 If you’re a busy Chrome-user and hate switching tabs to check email, the Checker Plus for Gmail extension will transform the way you interact with Gmail when using Windows. It may even make you question why you didn’t know about this sooner. 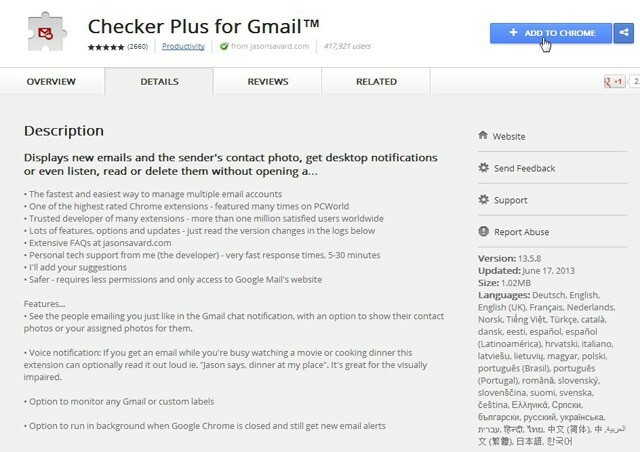 What Checker Plus for Gmail does specifically is make it possible to manage your Gmail account in your current window and to receive notifications right on your desktop as well, just like with Yahoo Messenger. With 417,000+ users and counting, you know this extension is going to have features you will like. 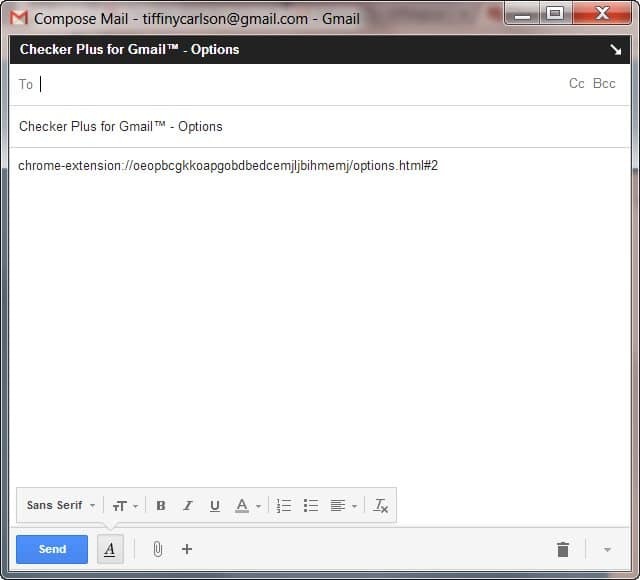 Our guide will outline how to use the popular Checker Plus for Gmail extension for Chrome. Before you do anything, downloading this extension is your first step, and it’s quick and easy. First, open Chrome and go to the download page for Checker Plus for Gmail in the Chrome Web Store. Once here, click the blue “Add to Chrome” button. 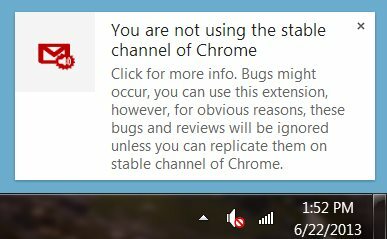 After you click, follow the prompts to install the extension, and once it’s installed you may get a warning message telling you the new extension may make your browser unstable. Don’t panic. Just ignore this message and continue exploring the set-up screen, which will appear once you’ve installed the extension. An icon for Checker Plus will also now be visible in your Chrome toolbar. To start seeing the full functionality of the extension, sign into one of your Gmail accounts by clicking the icon in the toolbar. After you login to your account, when you click the icon a pop-up menu your most recent emails will appear. A number indicating the number of new emails you have will also appear over the icon. When a new email arrives, you will get a notification that will flash in the bottom right-corner of your browser. You can read a new email from the toolbar icon as well, which is called “preview” mode, but it can be used as if you were in the inbox itself. Click the icon for Checker Plus, then click the new email, and it will appear in an enlarged pop-up menu. You can reply directly from this menu, so you don’t have to leave your current window, which for many fans is their #1 favorite function of this extension. Simply hit “Reply” at the bottom of the message in preview mode and a cursor will appear. Additionally, in the toolbar pop-up menu, you can click the “Link” icon to send a link of whichever page you’re on to someone via email. After you click the link icon, a compose field will appear on the left side of the screen. There is an option to access your contacts and to search through your archive. To adjust the settings of Checker Plus, click the gear icon in the pop-up menu and it will take you to the “Options” area in a new tab. Once here, don’t get overwhelmed by the number of options this extension provides. One of the most exciting option you’ll find is Voice Notifications. 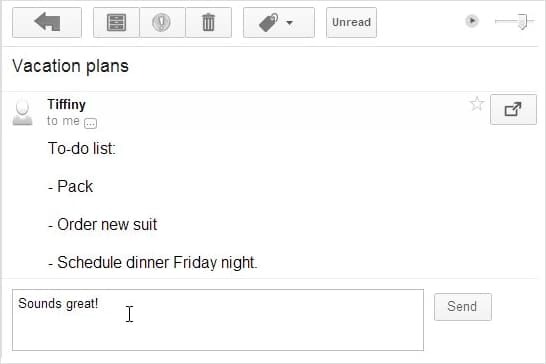 Voice commands can control this extension, making it even easier to quickly access your Gmail account. It helps that the voice recognition in Chrome is quite good. 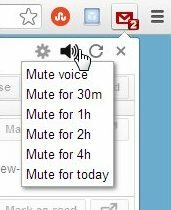 Once you’ve turned on Voice Notification, you can access the mute controls for this via the toolbar icon. Just click the sound icon, and a pop-up menu and the options can be accessed. Another feature in the settings area you’ll find is the option to show contact photos and details of said contact when an email arrives from them. If you still want this extension to operate even if Chrome is closed, it’s possible. 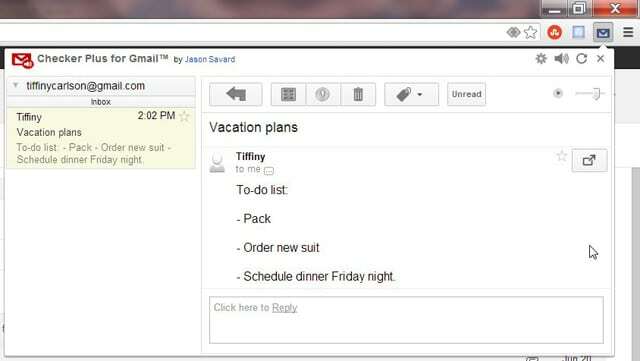 This is a great idea for anyone who loves their Gmail, but prefers to use another browser. 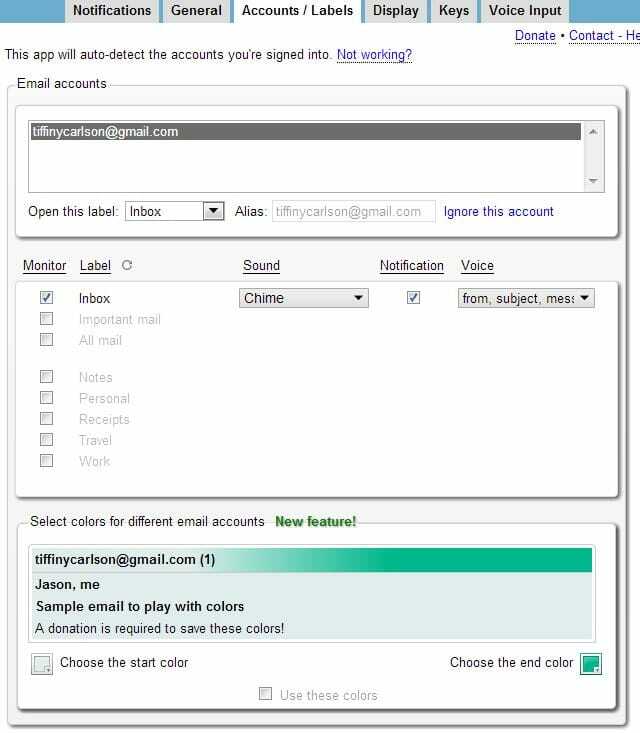 The rest of the settings area contains one of the most impressive selection of options seen with any extension, from managing your Gmail account and keyboard shortcuts to its display color. 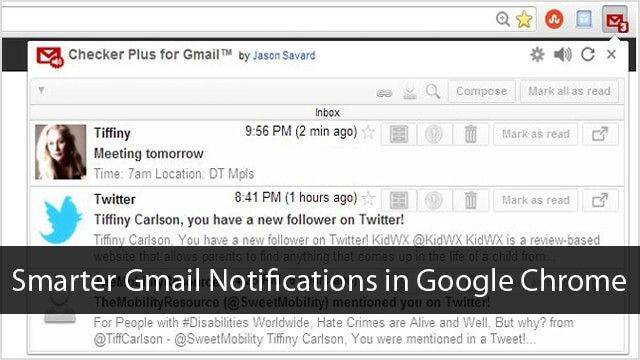 For heavy Gmail-users, this extension is almost a must; it’s that good. After using it for a short time, it’s hard manage without Checker Plus. The entire interface is sleek, easy to use, and zips right along. Anyone with a Gmail account should definitely check this out. If you’re looking for another way to use multiple Gmail accounts faster than ever, learn about Gmail’s “canned response” feature and how it can reduce your response time to emails.